Makita has come out with a new 10-inch sliding compound miter saw (model LS1018) designed to meet the needs of finish carpenters, flooring installers, and other trades who require both accuracy and portability. Weighing in at only 43.7 lbs, they have portability covered, but what about accuracy? With claims like "dead-on" accurate, Makita seems confident that the linear ball bearing system they have engineered will meet the needs of professionals, but only the reviews can tell us this for sure. The saw miters 0° to 47° left and 0 to 60° right, with positive stops at 0°, 15°, 22.5°, 31.6°, and 45° (left and right), but the bevel only has positive stops for 0° and 45° (left and right). What, no 22.5° or other common bevel angles? With a 12-inch crosscutting capacity at 90-degrees, and 8/12-inch capacity at 45, the LS1018 should be plenty of saw for most carpentry needs, even though it is only a 10-inch saw. 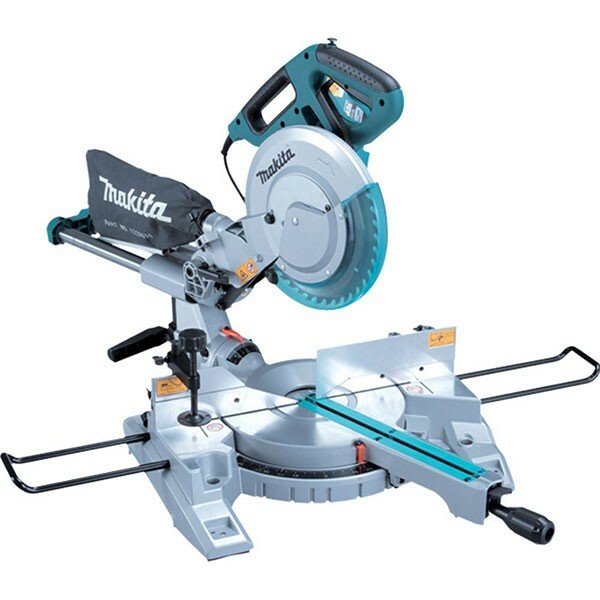 Powering the saw is a direct drive 13-AMP motor with both a soft start, and an electric break. Makita is also using a new ergonomic handle design with a large trigger that they say is more comfortable to use. Most brands don't bother with bevel detents, because they are hard to implement, or they rarely get used, but sometimes they can really come in handy. What I really wish for though, is a bevel detent that can be adjusted by the user. Oftentimes you need to bevel to a certain degree over and over throughout the day, and having an adjustable stop would be a real timesaver; if it were even possible to implement. 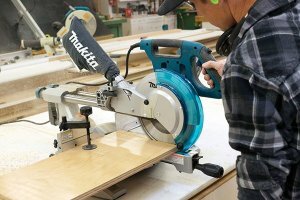 Maybe Makita's new ergonomic handle can change my mind, but I am usually not a fan of vertical trigger grip miter saws. It is just easier on the wrists to use a horizontal grip and perform bevel cuts in both directions. I will not pass final judgment until I have at least had the opportunity to try the saw out, but I really wish they would stop using vertical triggers.